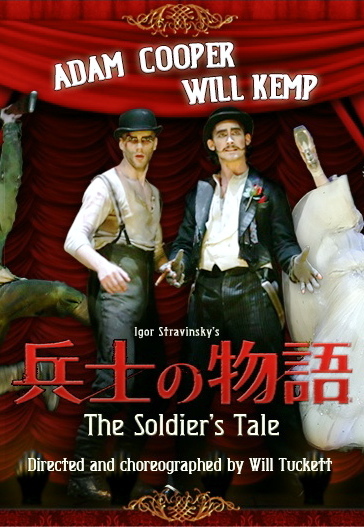 WillKemp.org » Blog Archive » Soldier’s Tale goes to Japan! Soldier’s Tale goes to Japan! Will Kemp fans will remember The Soldier’s Tale from it’s performances at The Opera House’s Linbury Theatre in London - well it is now going to Tokyo & Osaka this September! Japanese audiences are in for a real treat as this is the first time Will Kemp and Adam Cooper have been in the same production together in Japan. Will plays the role of the Narrator in what The Critics call “Heaven, Hell and all points between” - The Observer, “A production that allows every member of the team to fly” - The Guardian, and simply “A Triumph” - The Financial Times. Visit the japanese website for more info. This entry was posted on Monday, July 20th, 2009 at 11:29 am	and is filed under Soldier's Tale. You can follow any responses to this entry through the RSS 2.0 feed. Both comments and pings are currently closed.